Location: Privett Road (B3333) now runs through the site of the halt. The halt was sited just west of the roundabout at the junction with Gomer Lane. Notes: The halt was originally to have had two low platforms, one either side of the level crossing. It is unclear whether these were ever built. The halt was opened as Privett Halt but was renamed Fort Gomer in October 1909 to avoid confusion with Privett Station on the recently opened Meon Valley Line. At one time trains only stopped by request. The halt was closed on 31.8.1914 and reopened 1.10.1914. The Lee-on-the-Solent Railway Company obtained their Act of Parliament on 14th April 1890. By early 1892 little work had been carried out but by the spring of 1893 the line was nearing completion and was ready for a Board of Trade inspection on 15th July that year. It was originally planned to operate the line as a tramroad using American style coaches with end steps down onto low platforms. 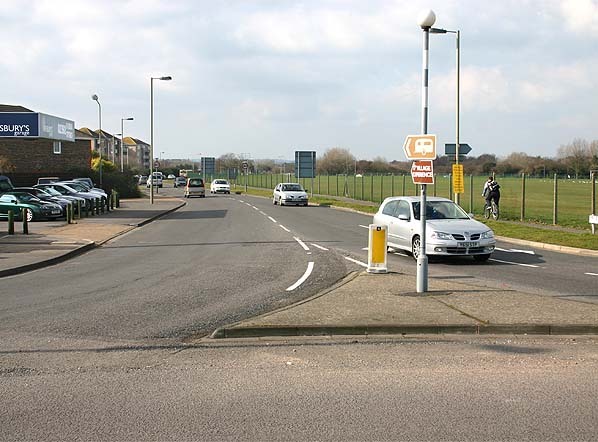 Four stopping places were to be provided at Elmore, Browndown, Privett and Pound Lane Crossing. 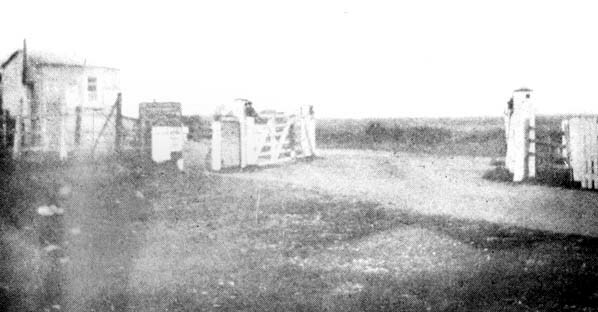 The latter three having a level crossing with a platform either side of the crossing. Only two were built however at Browndown and Privett. The line failed its inspection on 13 points. Among other changes the Board of Trade insisting that if through trains were to run from the LSWR then standard height platforms would be needed at all the stations. The line finally opened on 12th May 1894 with a locomotive hired from the South Western. The initial service comprised eight trains each way daily with three on Sundays, all services calling by request at the two intermediate halts. Early passenger numbers were disappointing due in part to the lack of any through trains and a possible takeover by the LSWR was discussed as early as 1896 but the line was to remain independent until takeover by the Southern in 1923. A new halt was opened at Elmore on 11th April 1910. The railmotors lasted until 1915, when the working reverted to locomotive haulage and 'push-pull' trains which remained in use until closure of the line. With the coming of the 1921 Railways Act the company was still in debt and the Southern were unwilling to take over the line as they would also be liable for its debts but on 4th January 1923 they finally agreed to take on the ailing company; the Lee-on-Solent board were glad to be rid of it. An improved service under Southern control did nothing to improve the fortunes of the line due to competition from local busses and trams and the continuing inability of the company to offer through trains to London. Eventually the Southern realised that there was little prospect of the line ever making a profit. In 1930 guards were withdrawn from trains on the Lee branch which led to difficulty collecting fares from the few passengers traveling between the halts. As a result it was agreed that the three halts should be closed from 2nd May 1930. The savings made did nothing to improve the fortunes of the line and total closure was announced for 1st January 1931. The closure was met with indifference form the local community with only six men and a dog traveling on the last train. Looking south west towards the site of Privett Halt in March 2006. Privett Road B3333 has been built on the course of the railway obliterating the site of the halt.